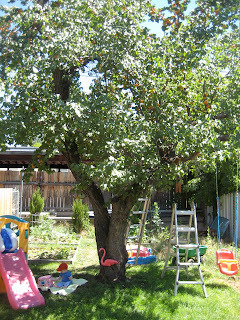 We have a beautiful Apricot tree that yields tons of fruit! So this year instead of making Apricot Freezer Jam I'm going to freeze Apricot Fruit Spread. I just made a cup of it to make sure it was wonderful AND IT IS! ---side note---I know I'm always saying things are AMAZING etc...everything I make is not amazing. I only put the great stuff on the blog. There is much that doesn't make the cut...in fact I made bran muffins the other day....trash can. It was sad. This is the same recipe as the Homemade Strawberry Fruit Spread. 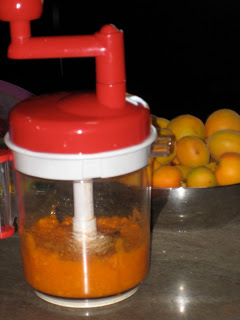 I crushed the apricots in this handy tool. I've had if for 5 years but just barely realized it...lol That says bad things about my cupboard organization. This was thicker than the strawberry fruit spread. You can always play with the amount of water you add. Hey, thanks for this recipe! We canned apricot jam today, only getting 8 jars after a lot of work. I had a little bit of apricot left and decided to try your recipe! It's in the microwave right now and I think it's perfect. I used up all my apricots! Yay! hahaha...as a Floridian, loved that pink flamingo in front of the tree! That would be so neat to have an apricot tree!